In a letter this May, Senator Ron Wyden called on FCC Chairman Ajit Pai to recuse himself from an ongoing FCC investigation into companies gathering real-time location data on cellphones users. As an attorney six years ago, Pai represented one of the firms now central to the investigation. The firm, Securus, a major provider of inmate call services to jails, is known to have provided location data on mobile customers to law enforcement officials without a court order. But despite his past work for Securus, Pai says he will not recuse himself. According to the chairman, the FCC Office of General Counsel has cleared his involvement in the investigation. In his letter, Wyden said Pai recusing himself was the responsible thing to do. “Chairman Pai’s past work for Securus makes it untenable for Mr. Pai to lead this investigation,” he said. Pai made the announcement to not recuse himself from the investigation this week during an oversight hearing before the Communications and Technology subcommittee in response to a question from Senator Mike Doyle, the committee’s ranking Democrat. Asked if he had gotten an opinion from the FCC ethics office, Pai said that he had. The FCC did not respond to multiple requests for comment. In May, the New York Times reported that Securus had given location data to a former Missouri sheriff who is accused of illegally tracking citizens’ cellphone locations for personal reasons. His targets, the Times reported, included a judge and members of the State Highway Patrol. Securus obtained the data it sold indirectly from LocationSmart, a “location aggregator” that purchases access to cellphone data from major U.S. carriers, including AT&T and Verizon. A mobile marketing firm, 3Cinteractive, likely purchased the data from LocationSmart and then sold it to Securus. The sale of location data is supposed to require the consent of mobile customers, but mobile carriers typically rely on firms like LocationSmart to acquire it, and there are few checks in place to ensure that consent was actually given. What’s more, the sale of location data was never intended to benefit law enforcement agencies. The entire process was meant to be used primarily for marketing purposes, or to prevent credit card fraud, or provide roadside assistance—services that benefit consumers only after they had given their consent. As Gizmodo previously reported, Chairman Pai was accused last year of a conflict of interest involving Securus when the FCC abruptly dropped its defense of an Obama-era regulation capping the cost of prison calls. Before Pai was appointed chairman by President Trump in early 2017, the FCC was preparing a legal defense against companies like Securus, which had argued in court that costs related to inmate calls fell outside the scope of the agency’s authority. Prior to the cap, the cost of calls between inmates and their families had skyrocketed, reaching in some cases up to $14 a minute. 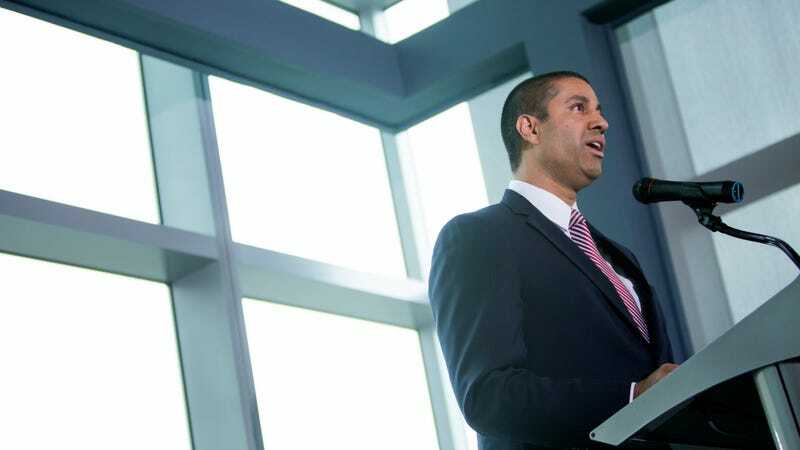 After Pai became chairman, the FCC abandoned its case, allowing a D.C. federal appeals court to summarily abolish the cap. The ruling was nothing short of a windfall for Pai’s former client and other profit-hungry corporations that had been for years gouging the families of incarcerated Americans.